On Easter Sunday, 1722, Dutch explorer Jacob Roggeveen came across a small island in the Pacific Ocean with about 2000-3000 inhabitants. Considering the date, he named the Island “Easter Island”, but its local name is Rapa Nui. The Rapa Nui population of Easter Island was already in decline at this point, and continued to decline further until an all time low of just over a hundred people in 1877. A classic theory that explains the population decline involves the massive statues found all over the island. 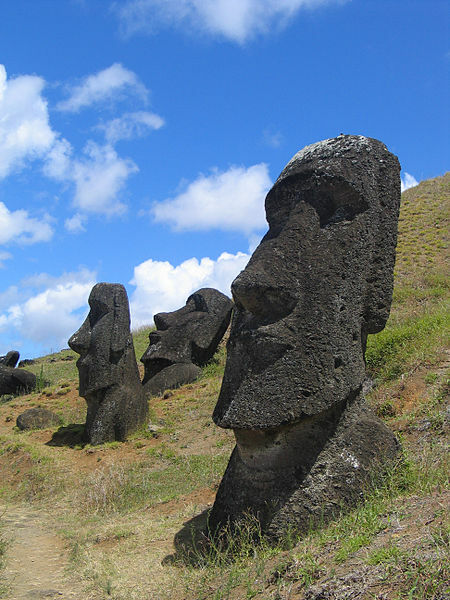 The Easter Island heads, or moai, were carved from volcanic stone between approximately the year 1100 and 1650. This coincides with the time during which, according to paleobotanists, Easter Island went from being heavily forested to completely treeless, which led to the idea that the population used up all the trees in carving and transporting these giant statues. Thanks to this theory, the historic population of Easter Island has been widely used as example of humans being too selfish, using up resources for their own enjoyment, without considering the consequences. If this is indeed how the islanders moved their statues, they wouldn’t have had to cut down trees for it, and not used all their efforts in making statues. But regardless of this theory, making statues was probably not the islanders’ only concern, and without that they would likely have seen deforestation and population decline anyway, perhaps due to Polynesian rats eating all the tree nuts. So if you discover any islands this Easter weekend, perhaps plant some trees while you’re there. This entry was posted in Have Science Will Travel and tagged Easter, Easter Island, Rapa Nui. Bookmark the permalink. Reblogged this on Sharks' Pond 2014.